DOES TROPICANA EVANSVILLE PROVIDE TRANSPORTATION TO AND FROM EVANSVILLE’S REGIONAL AIRPORT? Yes. Please contact Tropicana Evansville’s Hotel Valet to make arrangements. DOES TROPICANA EVANSVILLE HAVE FREE PARKING? Tropicana Evansville has free self-parking in an enclosed, attached garage. Valet service is available at both Tropicana Evansville and Le Merigot Hotels. HOW DO I APPLY FOR A JOB WITH TROPICANA EVANSVILLE? Click here to go to the employment page. DOES TROPICANA EVANSVILLE OFFER TRANSPORTATION FROM NEARBY CITIES? DOES TROPICANA EVANSVILLE PROVIDE SCOOTERS OR WHEELCHAIRS? Scooter rental is available. Fees: $15 for up to 4 hours. 24-hour rental is $30. TROP ADVANTAGE® card balances may be used toward rental fees. Please inquire at the Tropicana Evansville Hotel Registration Desk. Tropicana Evansville does not provide wheelchairs. 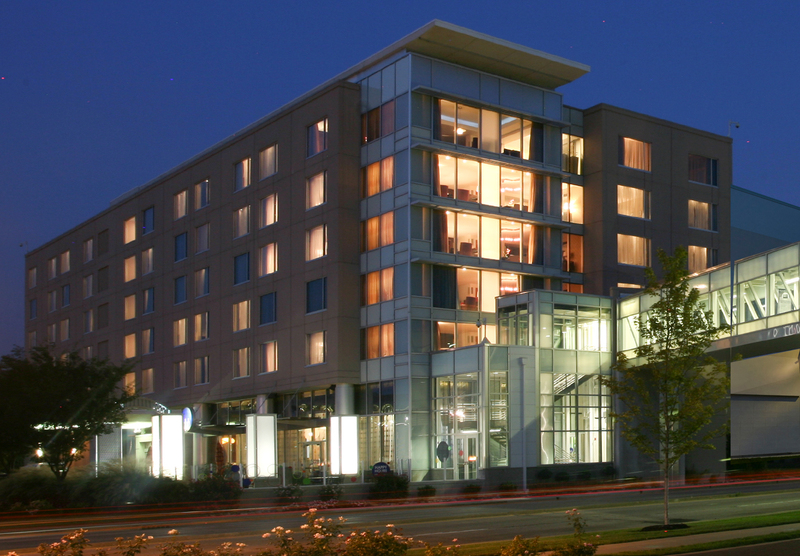 DOES TROPICANA EVANSVILLE HOTEL OFFER ROOM ACCOMMODATIONS FOR THE PHYSICALLY CHALLENGED? The Tropicana Evansville Hotel has twelve handicapped-friendly hotel rooms. DOES TROPICANA EVANSVILLE HAVE MEETING FACILITIES? Our Executive Conference Center boasts over 7,800 square-feet of meeting space. Whether it’s an intimate group of 10 or a large meeting of 300, you’ll enjoy state-of-the-art facilities and our warm and friendly staff to help with everything. Our planning experts will work with you to create a completely customized event. To schedule an appointment please call the Catering Director, at (812) 433-4332. Can the hotel accommodate wedding receptions? Yes. Tropicana Evansville’s expert staff will work with you to create a completely customized event. To schedule an appointment please call the Catering Director, at (812) 433-4332. DOES TROPICANA EVANSVILLE OFFER SMOKE-FREE AREAS? All public spaces of the Tropicana Evansville complex are non-smoking. Smoking is limited to designated areas of the Casino and designated Hotel Rooms (must be 21 years of age). DOES TROPICANA EVANSVILLE SERVE ALCOHOLIC BEVERAGES? Full bar service is available at two restaurant and three casino bar locations. IS THERE A COVER CHARGE TO ENTER THE CASINO? There is no cover charge to enter the Casino. However, you must have a valid I.D. and must be 21 years of age. WHAT ARE TROPICANA EVANSVILLE’S HOURS OF OPERATION? The casino and hotels are open 24 hours a day, 365 days a year. Any changes to this schedule will be publicly posted in advance. The restaurants and lounge maintain separate hours. Please refer to the website for hours of operation. WHAT IS TROPICANA EVANSVILLE’S ADDRESS? WHO SHOULD BE CONTACTED FOR MEDIA INTERVIEWS? Please contact Tropicana Evansville’s Director of Marketing at (812) 433-4069. DOES TROPICANA EVANSVILLE HAVE A RESTAURANT? Tropicana Evansville has four restaurants ranging from gourmet to casual. Find the food to fit your mood at Tropicana Evansville. Please refer to the website for restaurant details. IS THERE A GOLF COURSE CLOSE TO TROPICANA EVANSVILLE? Earning Periods are January 1, 2018 through December 31, 2018. WHAT FORMS OF ID DO YOU NEED FOR A JACKPOT PAYOUT? Alarm clocks? Clock radios with alarms are located in each guest room. Additional wake-up service is available through the hotel operator. Cable TV? Yes. Stations include: ABC, CBS, NBC, CNN, ESPN, FOX, PBS, weather, cooking, travel, sports and many more including pay-per-view movies. Roll-away beds? Yes. These are free for use upon request with limited availability. Irons and ironing boards? Yes. Refrigerators? Yes. These are free for use upon request with limited availability. Laundry facilities? Please contact the Hotel Front Desk for off-site dry cleaning and laundry services. Microwaves? Available only in Suites. Safes? Safe deposit boxes are available at the front desk. Suites are furnished with safes. VCR/video game hook ups? No. Wheelchair accessible rooms? Yes. Limited number. Baby Cribs? Yes. These are free for use upon request with limited availability. HOW OLD DO YOU HAVE TO BE TO CHECK IN TO YOUR HOTELS? You must be at least 21 years old to check-in and stay at the either the Tropicana Evansville Hotel or Le Merigot Hotel. In order to receive a full refund, we require room cancellation by 6PM on the scheduled arrival date. DO YOU ALLOW PETS IN THE HOTELS? The Tropicana Evansville Hotel allows pets to stay in rooms with a $100 Pet Deposit. The Pet Deposit on a credit card will be required and refunded if no damages occur. Le Merigot does not allow pets. HOW DO I SEND OR RECEIVE A FAX AT YOUR HOTELS? Ask for assistance at the Hotel Front Desk. King rooms sleep 3 persons with one King bed and one rollaway bed. Queen rooms sleep 4 persons with two queen beds. Standard Suite sleeps 2 persons. Presidential Suite sleeps 2 persons. CAN I PRE-ARRANGE TO HAVE FLOWERS OR A GIFT SENT TO A GUEST PRIOR TO THEIR ARRIVAL? Yes. Please contact Guest Services to arrange an amenities request with 48 hours notice. DO YOUR HOTELS OFFER ROOM SERVICE? Tropicana Evansville Hotel and Le Merigot provide limited room service for our guests. HOW MANY ROOMS AND SUITES DO YOUR HOTELS HAVE? DO YOUR HOTELS HAVE SUITES? 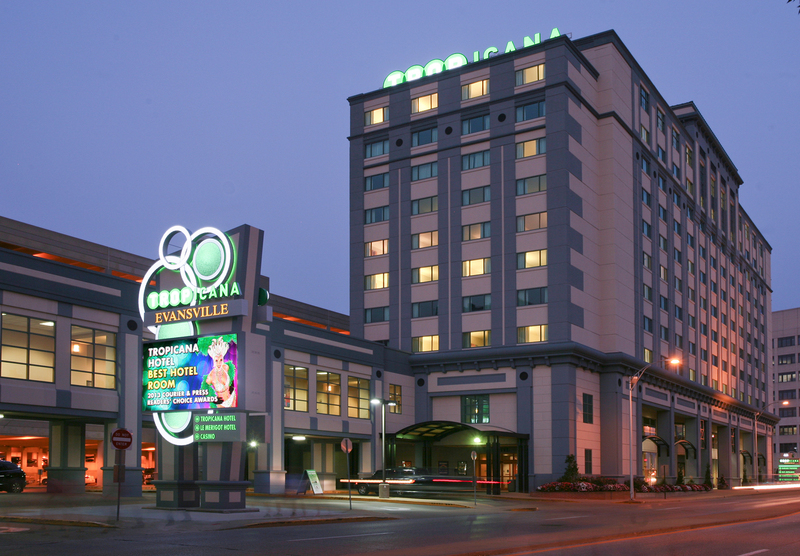 Tropicana Evansville Hotel – 243 Standard Rooms and 10 Suites. Le Merigot Hotel – 95 Standard Rooms and 5 Suites.